Heineken drinkers on the Emerald Isle have the chance to buy the most expensive bottles of Heineken ever produced–probably. 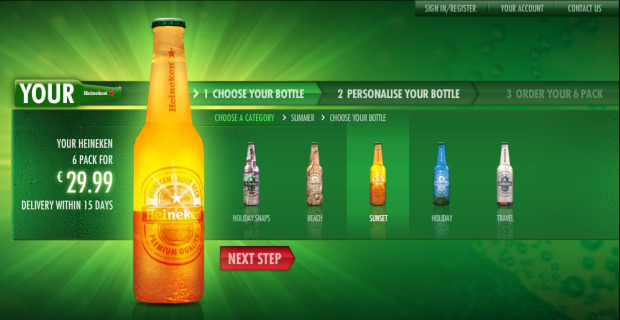 For a thimbleful under $38 you get a six-pack of bottles that you can customize yourself. The digital marketing campaign is the brainchild of the AKQA agency, and it allows drinkers to add text and image of their own onto 42 different bottle designs. The Web site allows you to print a message on the front, as well as adding a picture and/or a few lines about what a responsible drinker you are and that you are over 21, honest. Pay up, and in two weeks, your customized beer arrives on your doorstep. Clink! The brewing company is getting pretty savvy with its digital marketing. Just a few weeks ago it launched Cheers, an iPhone app that turns your screen into toast. A toast, sorry.